Fungilin (Amphotericin) is an anti-fungal medication used to treat patients suffering from oral thrush. It works by destroying or slowing the reproduction of fungus cells allowing the immune system to control or destroy the infection. 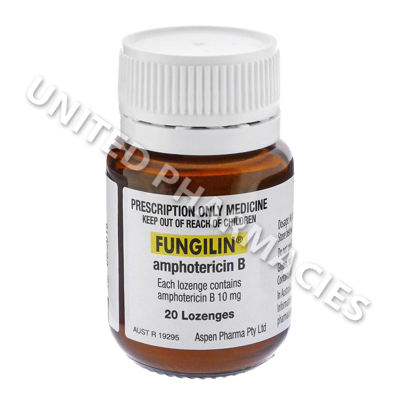 Fungilin (Amphotericin) is an anti-fungal medication used to treat patients suffering from oral thrush. It works by destroying or slowing the reproduction of fungus cells allowing the immune system to control or destroy the infection. This can prevent the appearance of a white film on the tongue, sores, or a mild burning sensation in the mouth. Your doctor may also prescribe this medication to be used along with others to get the best results from treatment. Fungilin (Amphotericin) comes in the form of an oral lozenge that is meant to be kept in the mouth until dissolved. One lozenge is normally used once or twice daily, but your individual directions will depend on your health condition and the severity of your symptoms. Always finish the prescribed cycle of medication, even if your symptoms have disappeared, as the infection may not be gone and can return stronger or more resistant to treatment. Ask your doctor any questions you have about the medicine to ensure the correct usage. Stop using the medicine and contact your doctor immediately if you experience any intense or worrying symptoms such as signs of an allergic reaction such as rashes, hives, swelling, or difficulty breathing. These conditions may require special adjustments to your dosage, frequency of administration, or emergency medical attention in serious cases to prevent further health problems from occurring. These lozenges are not meant to be chewed or swallowed. Instead, they should be placed in the mouth where they can slowly dissolve. Always use Fungilin (Amphotericin) as you have been prescribed by your doctor. Never self-medicate or change your dosage without first consulting your doctor. The correct dosage can vary depending on your health, medical history, and the severity of the condition being treated.